A limited set of artist-signed prints are available. 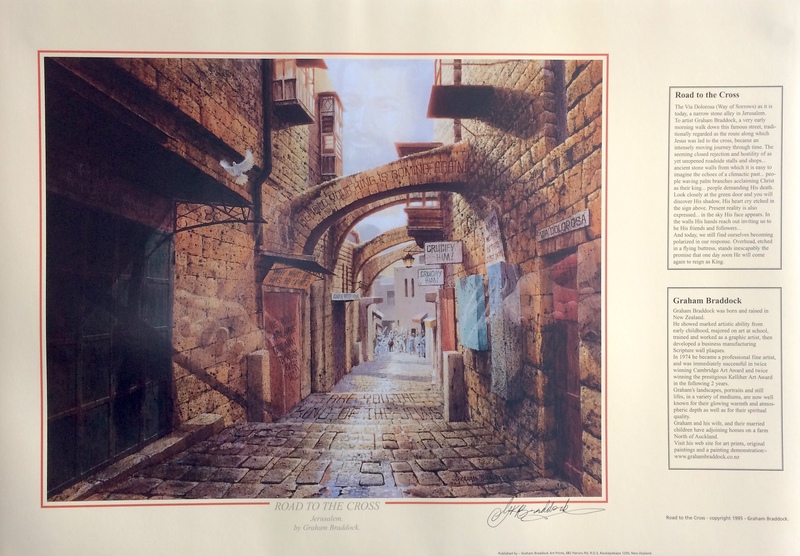 Purchase and enjoy this beautiful piece of art, and know that you are supporting the mission that is presenting Christ the King to the nations by media. Enjoy this intricate work and find scriptures, promises and images etched into the street and the sky. Pick-up is available in Hamilton only, during normal office ours. Please make your purchase online, and email office@febc.nz to arrange collection. A limited number of signed prints are available. Purchase and enjoy this beautiful piece of art, and know that you are supporting the mission that is presenting Christ the King to the nations by media. Enjoy looking down the ancient Jerusalem street where New Zealand artist Graham Braddock has captured the hostility and hope of that tumultuous weekend we call Easter. 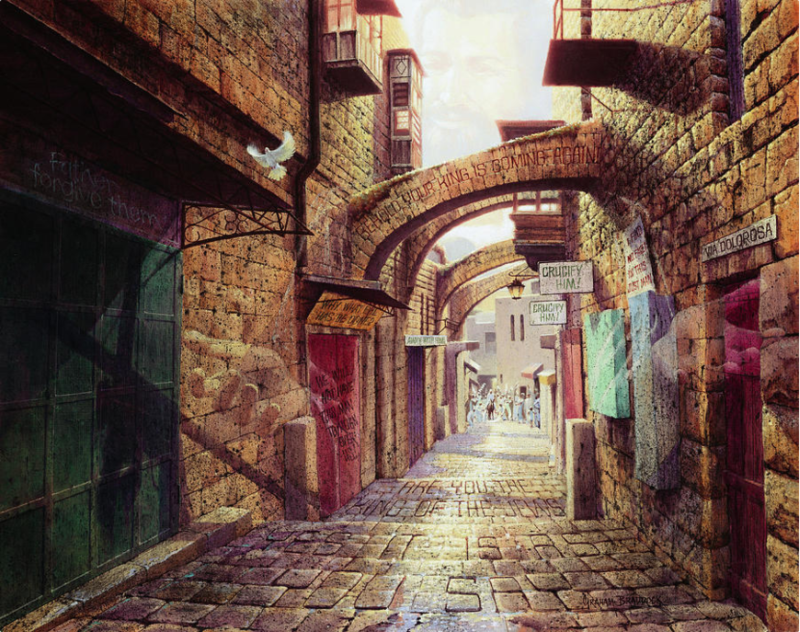 Find scriptures, promises and images etched into the street and the sky. 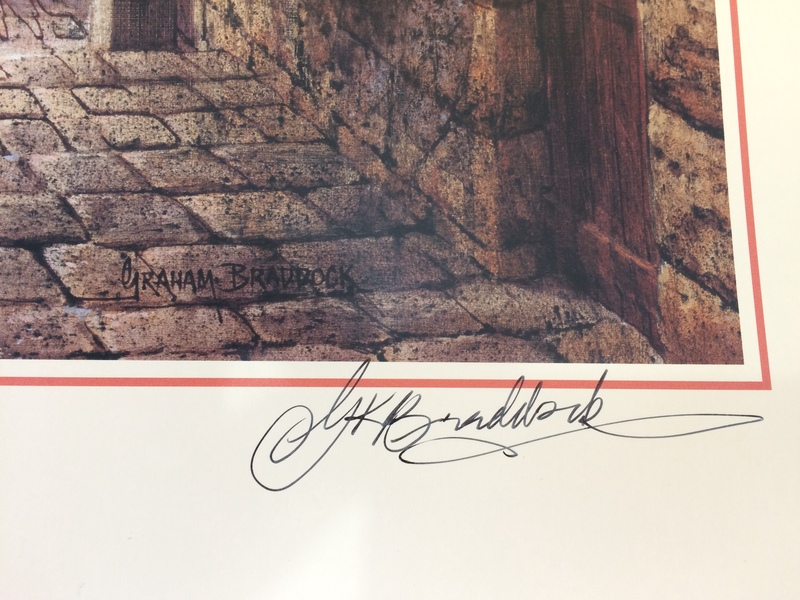 This print is personally signed by Graham, and is set with a description of the work and a short biography of the artist. Actual size of the print is 60 cm by 42 cm. Couriered to you in a firm cardboard tube: 70 cm by 8 cm. People waving palm branches acclaiming Christ as their king. People who furiously demanded His death. Look closely at the green door and you will discover His hunched shadow, His heart cry etched in the sign above. Present reality is also expressed, in the sky His face appears. In the walls His hands reach out inviting us to be His friends and followers. Overhead, etched in a flying buttress, stands inescapably the promise that one day soon He will come again to reign as King.